I was so exicted to see you on Oprah. Many of the things you mentioned were familiar to me but I had not acted on them. On our first mortgage, we did pay an advance principal payment every month which helped when we refinanced for 15 years at a much lower interest rate. I purchased “The Automatic Millionaire and took it with me on vacation. I read it in two days. 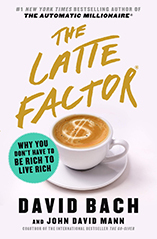 When I got home I was excited about checking out my latte factor and implementing many of your suggestions. I discovered that most of my latte factor is eating out with friends and for lunch at work. I am now taking my lunch to work and cutting down on eating out with friends. I now invite them to eat at my house, and everyone chips in the expense. I am able to save $75.00 a week. I have increased my IRA and increased my 401k by 1%. I am presently looking into purchasing bonds to diverify my profolio. I am also making an extra payment with my income tax money and applying it toward the principal. It has taken me some time, but I am making most of my bill payments automatic. Once the process is automatic for 6 months, I am going to call them and investigate getting a lower interest rate. My plan is to improve my credit rating so I can buy foreclosure homes, have my brother fix them, and sell them at market value. This is a two year plan. I look forward to becoming a millionaire and being able to help others become millionaires.